Apple has gone to unusual lengths to thoroughly and definitively refute a Bloomberg Businessweek article that today suggested Chinese spies had planted microchips in the Chinese-made Supermicro server motherboards that Apple uses in its facilities. Following the publishing of the article, Apple released a strongly worded statement calling Businessweek's report inaccurate with no evidence to support the claims, and this afternoon, Apple went further and published an entire rebuttal on its website. Apple's press release includes the same statement that was initially provided to Bloomberg Businessweek, along with additional information that the company says it shared with Bloomberg Businessweek ahead of when the server article was released. While Bloomberg Businessweek's report claims that Apple reported the alleged microchip incident to the FBI in 2015, Apple told the news site in no uncertain terms that no one from Apple ever reached out to the FBI, nor had Apple ever heard from the FBI about an investigation. Apple also told Bloomberg Businessweek that despite "numerous discussions" across teams and organizations, no one at Apple had heard anything about the supposed microchip investigation. Apple's initial statement, available below, was shared this morning after Bloomberg Businessweek published its article claiming Apple discovered illicit microchips in its Supermicro server motherboards that were able to inject code or provide instruction to the CPU with the ultimate goal of providing the Chinese government with access to "high-value corporate secrets and sensitive government networks." Bloomberg Businessweek claimed to have spoken to officials with knowledge of the investigation, which Apple says did not happen at all. Along with Apple, Bloomberg Businessweek claimed that other companies, such as Amazon, were also affected. Amazon has also issued a similarly worded denial. According to Amazon, the report is untrue and Amazon has never found any issues "relating to modified hardware or malicious chips in Supermicro motherboards" nor has Amazon participated in an investigation with the government. Supermicro has also denied all reports and says it is not aware of any investigation regarding the topic. Journalism is going downhill, fast. Literally how can you say this when you have absolutely ZERO clue whether this story is true or not? I think rather than journalism going downhill fast, media literacy has been going downhill for years. I don’t blame them for standing by their word. Bloomberg is huge, as is its audience, and this could result in major public opinion setbacks. Shame on Bloomberg. They need shocking stories to keep afloat. If the editor did a poor job in their investigative journaling, regardless of authenticity and (lack of) proof, it goes to show you how powerful media snakes can be. The line between conspiracy theory and actual events are becoming blurred. So.. Do people really think that Bloomberg would be dumb enough to publish an article taking on the two most powerful and valuable companies, along with the Chinese government without credible sources? The great length by both companies to deny this shows it really got under their skin.. So either Bloomberg is poking a wound or it's really fake news. Somewhere in the middle though, is the truth. Zero clue? Apple just said it's plain false. I certainly trust a formal Apple statement more than Bloomberg. Resorting to an old school personal attack surely strenghtens your point. You trust the most valuable company in America to tell the truth about something that could take that very title from them? 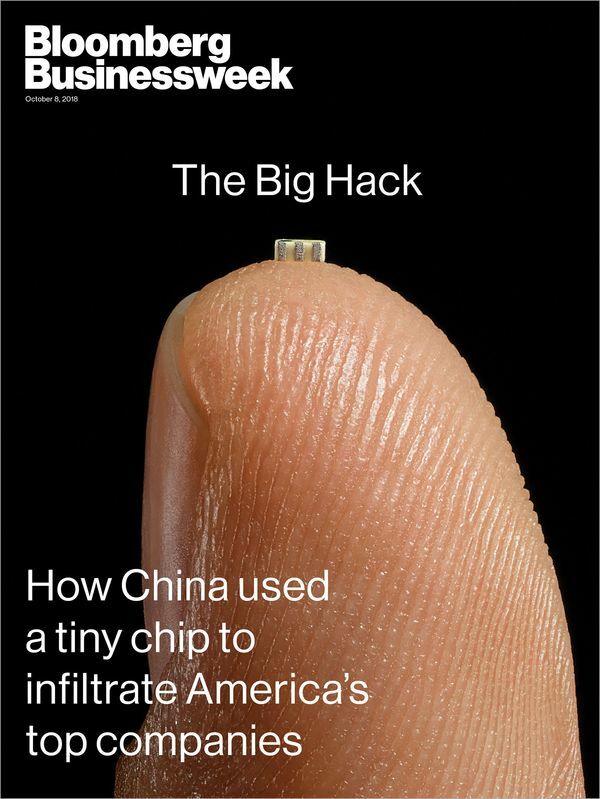 At this point, it's more likely the NSA added the chip and then pointed fingers at China when discovered. Snowden, PRISM, and all that. After all, Apple has openly refused to help the FBI. What better way to teach Apple a lesson than to seed a fake story? Well, if Apple doesn't sue Bloomberg for libel, then there's your answer. Good on apple to throughly dispute this, won’t stop the haters posting here though. Apple has strong financial incentive to not admit it even if it’s true. There is no situation where Apple and Amazon would publicly admit to being compromised by China even if a breach did happen. As such, why is anyone taking Apple’s word at face value? There the least reliable ones to ask in this situation. Lmao, you just randomly believe everything a business tells you, just because? Are you serious? Even if true you do realize there is no situation where Apple would actually admit something like this right? It is helpful to employ critical thinking before commenting on these things. The Businessweek journalists who reported this could be in deep **** if they're found to be trying to short the stock of the two most valuable companies in the world. It's happened before. Oh, Apple made a "formal statement" did they? Well that certainly settles it! Apple has billions of dollars in value invested in their image of keeping your data secure. Is it any surprise at all their PR machine would go into overdrive to refute evidence that their infrastructure (along with that of many other companies) might have been compromised by their Chinese supply chain? Bloomberg has nothing to lose with this piece, but lots of page views to gain. It's a cloak and dagger article, with no named sources, redacted documents, nor even grainy images of the so-called chip. Ars Technica has a similar artical last year theorizing Apple dumped Supermicro for malware found in firmware in their servers and Apple very diligently denied that too even though apparently there was cited reports that Supermicro had issues with Apple refusing to work with them on the issue and providing firmware version that apparently was incorrect and then stopped any discussions further. Does make me wonder why this is a constant thing brought up with decent detail laid out.